GridFSMaster Openstack from industry experts. Token is a type of authentication similar to password-based validation. A token gets generated once the user inserts the credentials and authenticates as a Keystone user. The token can then be used to access OpenStack services without any revalidation. It is interesting to note that a token is active for a limited period and must be renewed after regular intervals. To create a token, users first need to authenticate their Keystone credentials. 34. Describe the function of Filter Scheduler. The Filter Scheduler facilitates filtering and weighting to notify where a new instance can be created. It supports working with Compute Nodes. Filter Scheduler firstly creates an unfiltered dictionary of hosts and then filter them using related properties and makes the final selection of hosts for the number of instances as needed. 35. Define the Networking option in OpenStack. AvalabilityZoneFilter: filters hosts by their availability zone. 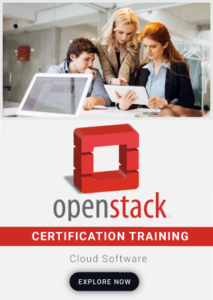 SameBackendFilterMost in-depth, industry-led curriculum in Openstack. 36. How can an instance be paused and also unpaused? Two types of command like $ nova pause INSTANCE_NAME and $ nova unpause INSTANCE_NAME are used to pause and unpause instances. 37. List down the Networking hardware in OpenStack. For all cloud computing paltforms, Hypervisor is a term to define virtual machine monitor(VMM) including hardware, software and firmware components running on a virtual machine. Host machine is the one having hypervisor with one or more virtual machines. OpenStack Compute allows multiple hypervisors. There are functionalities to choose one among them for a specific purpose. 39. List down the type of Hypervisors supported by OpenStack. VMware vSphere: VMware-based Linux and Windows via vCenter server connection. 40. Explain in brief the modular architecture of OpenStack.